Photobooth.net is the most comprehensive photobooth resource on the internet. We welcome your comments and appreciate your contributions. Read about the creators or contact us. The 2014 International Photobooth Convention was held in Chicago, June 6-8, 2014. To find out more, visit the Convention page. For the fourth year in a row, I’ve been lucky enough to travel outside the U.S., mostly for work, to a country with a homegrown photobooth scene, and have been able to check in with the enterprising person or people behind the ongoing existence of analog photobooths in their country (see 2016: Italy and the Netherlands; 2017: France and Czech Republic; and 2018: Canada). This streak continued earlier this month with a visit to Zürich and Lausanne, Switzerland. Last time I was in Lausanne for the “Derrière le rideau” art show in 2012, I found a lone booth in Zürich and a temporary machine at the museum in Lausanne where the photobooth exhibition was held. 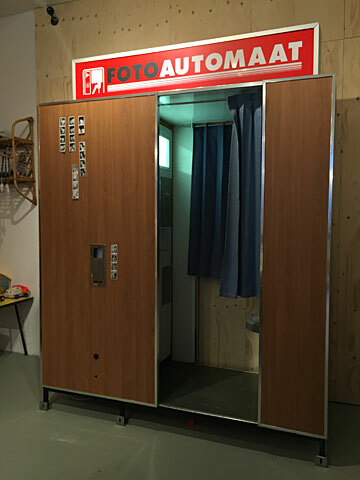 Seven years later, I’m happy to be able to report that the solitary booth in Zürich—which, for my money, produces the most beautiful photobooth photos I’ve ever seen—is still in operation, and is now joined by two new photochemical machines in lovely working order. And that temporary booth in Lausanne has remained long after the show closed, and is now a staple at the museum cafe where has resided ever since opening night, February 16, 2012. I arrived in Zürich on the morning of April 3, and my first stop after checking into my hotel was the familiar address of Goldbrunnenstraße 128, outside the home of the machine’s co‐inventor, Martin Balke. The machine is still in great shape, with only a few more stickers applied to the top sign indicating that time had passed since I was last there. I later learned that the machine may be in its last year at this location, but I’ll keep my fingers crossed that it doesn’t leave Zürich altogether. After taking as many 2 franc photos as I could manage with the change I’d gotten from from ViCAFE down the street (thanks! ), I bid farewell to the machine and headed out on the rest of my day. That evening, I met Patrick, who runs two photobooths in town, at his machine outside the Helsinki Club, at Geroldstr. 31. We had a great conversation about how he got started, the sort of experiences he’s had with the booth, his plans for the future, and so on, and took a strip in the machine. He was kind enough to then drive me across to his second booth, a machine we didn’t know about, located outside Kosmos, a new cinema, restaurant, and bar. We took another strip in that machine, looked at its immaculate inner workings, and talked about the vagaries of photobooth locations, vandalism (not a real problem in Switzerland), photobooth supplies, and potential new locations around town. Patrick sent me on my way with a great restaurant recommendation, and a promise to keep me posted on further Zürich locations to come. By Friday, I had made my way down to Lausanne, where my conference was being held, and I stopped in at the Musée de l’Elysée, where I had last been seven years ago. I had recently been in touch with Yannick, who takes care of the booth there, and was pleasantly surprised to hear that it was still up and running, long after the show that brought it there had moved on. When I arrived, I found out that Yannick was away for the week—my fault for not getting in touch earlier—and that, sadly, the machine was out of order. I asked Sebastien, the nice guy who was entertaining my inquiries, if I might take a peek inside, and he was happy to oblige. I cleared a jam in the feed down unit, fiddled with the transmission a bit, and bingo! it was back to life. The machine was already in great shape, so it was easy to troubleshoot, but making a quick fix certainly made me look more skilled than I actually am. I took some strips, including one with Sebastien, and reminisced about the great time I’d had at the show in 2012, while also learning about Platforme 10, the new multi‐institutional space that will become the museum’s home next year. Sebastien assured me the photobooth would be making the move with the museum. It was a real pleasure meeting Patrick, and despite my missed connection with Yannick, I felt like we met up if only through a few jammed strips in the machine and a cache of his test strips I spied on the top of the booth. Next time! And the year is not up yet—before the end of 2019, I hope to stop by the booths in Vienna and finally make a pilgrimage to the epicenter of the European photobooth scene, Berlin. Thanks to a tip from longtime friend of the site Stephanie back in December, we found about a photochemical booth located in the museum shop at the Whitney Museum of American Art in New York City. The booth was brought in to coincide with and help visitors celebrate the exhibition Andy Warhol: From A to B and Back Again, which opened November 12, 2018, and runs through March 31, 2019. We had a chance to visit ourselves this past weekend, and not only was the booth working (and quite popular), but of course the exhibition itself is full of wonderful photobooth‐based pieces, including some rare gems we’d not had a chance to see before. In addition to the photobooth itself, the museum shop offered a number of photobooth‐related items for sale, from a postcard reproduction of “Ethel Scull 36 Times”, on the more affordable side, to an empty aluminum can of Kirin beer with a reproduction of Warhol’s 1964 “Self‐Portrait” on it ($388). 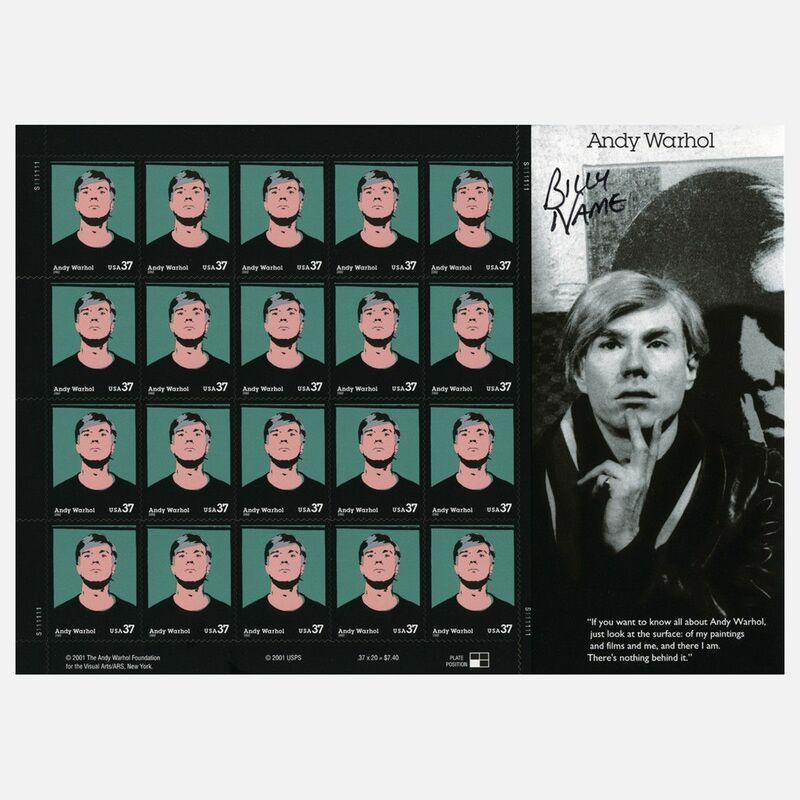 The USPS’s 2002 Warhol postage stamp was also for sale in a few varieties, singly in a lucite box or in a sheet of ten (though they seem torn from their original presentation sheet). If you’re in the area or are planning a visit to New York in the net few weeks, we encourage you to go see the show and take some photos in the booth! We begin our fifteenth (!) year of keeping track of all things photobooth with a major update of posts on photobooths in moving images. Over the last few years we’ve let discoveries and contributions in the realms of movies, TV shows, commercials, and music videos collect on our to‐do list, and today, we’re glad to finally present more than a dozen instances, from the surprisingly major to the completely minor. Thanks to all our wonderful contributors for sending in links, tips, and screen grabs over the years. In addition to films, we’ve also added a number of television shows, music videos, and commercials. Click the intriguing images below to see more from each of these photobooth‐friendly creations. As we come to the end of 2018, I’ve undertaken one of my periodic mass updates, in which I finally get to some of the contributions I’ve received over the last six months or so that I never had a chance to do anything with. We’re eternally grateful to our lovely contributors, and I’m only sorry I can’t get to these in a more timely manner these days. These are only there of many I’ve received; hopefully I’ll get to the rest sooner rather than later. So, today I can report a few new locations. First, a new booth location at a shop in Toledo, Ohio. Second, a temporary booth at the Whitney Museum of American Art, to appropriately accompany an exhibition about the work of Andy Warhol. And finally, the much‐delayed addition of an entry for the booth at the Museé de l’Elysée in Lausanne, Switzerland. The machine has been there since the wonderful “Derrière le rideau” exhibition back in 2012, but I’d never added it to the directory. Thanks to Maura, Stephanie, and Yannick for their contributions. The booth at Jupmode is a BW machine located in the conference room off this screenprinting and embroidering shop in Toledo, Ohio. Thanks to Maura for the info and photos of her and her husband’s new machine. At the Whitney Museum, a major Andy Warhol exhibition will be on through March, 2019. 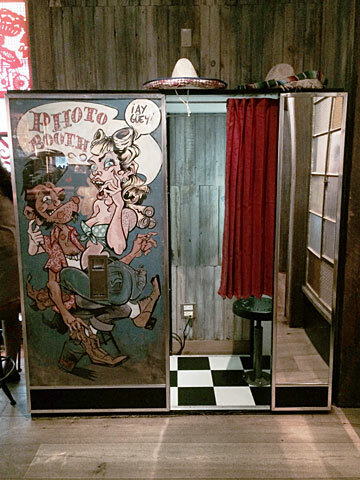 A photochemical booth is available for visitors to use in the museum store. Thanks, Stephanie! And finally I’d like to thanks Yannick at the Musée de l’Elysée in Lausanne for sending in a current photo and sample strip from black and white machine that was brought by Anthony Vizzari to the museum on the occasion of the exhibition “Derrière le rideau — L’Esthétique Photomaton” back in February, 2012. The booth has been providing joy to visitors ever since, and perhaps we can hope that the Whitney will follow Elysée’s lead! 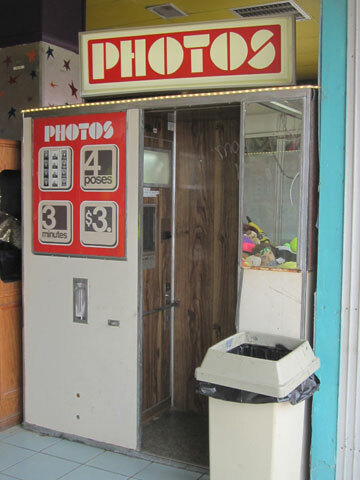 It’s been awhile since we’ve posted on the blog, but rest assured, behind the scenes we’ve been adding (and, sadly, subtracting) locations in the photobooth directory, thanks to you, our unflagging readers, and have been noting various films and other examples of booths in popular culture. Earlier this month, we made a family pilgrimage to Auto Photo in Montreal, catching up with Jeff and George, talking photobooths, and taking some photos, of course! Jeff was kind enough to set up one of the few remaining color photobooths in their inventory, which was a real treat. As the kids took photos, he and I talked about the general decline in commercially placed booths (in malls and metro stations) and the surprising trickle of business remaining in selling booths and parts to smaller scale ventures, like the local entrepreneurs around the U.S. and Europe who import Canadian booths for placement in bars and restaurants. Though photobooths in shopping centers and metro stations is in steep decline, there is some solace in the idea that quality Canadian craftsmanship is now giving people photobooth joy all around the world. Thanks to a tip from Meags, I also visited a completely unique color photobooth at North Star Pinball, a bar in Montreal. 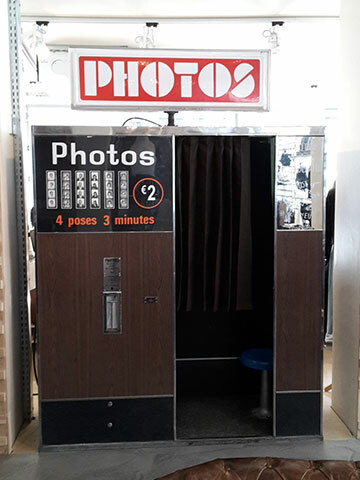 Not only are there very few photochemical booths outside malls and metro stations in Canada — we have only three listed, all in Vancouver — but this particular booth is equipped with special‐width paper (once used in consulates) and a modified camera, turning out square color photos. After decades of photoboothing in all kinds of machines around the world, there is something quite striking and almost unbelievable about seeing these square photos. If you’re in Montreal or are planning a visit, stop by and take some photos before the paper is all gone. Another trip, another chance to check in on one of our far‐flung photobooth correspondents, this time Alexander Spevak of Fotoautomat in Prague. It’s beginning to look from the blog at least that the center of the photobooth world has at some point shifted to Europe, with the most recent convention in England and my last four posts now taking stock of the booths and their caretakers in Italy, Netherlands, France, and now the Czech Republic. I met Alexander at the Rock Café on Národní in the center of town, and we took a few strips, and talked to a couple that came in to take some of their own. The booth is well maintained and obviously popular, and turns out a nice set of photos. Alexander and I discussed the customary topics—paper, chemicals, problems with vandalism—and also how they might work to find a location for their second booth. 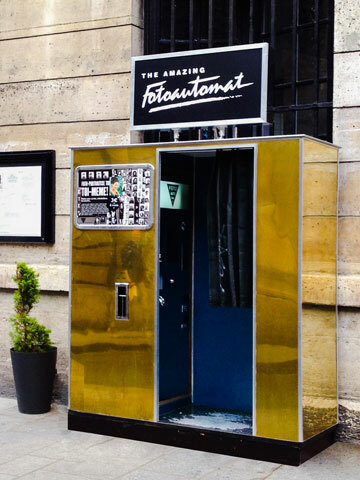 Even as Prague may seem a perfect town for photobooths, it can still prove difficult to find a location with the right combination of young people and tourists who also care about the difference between photochemical and digital. It’s always great to meet in person someone you’ve corresponded with about this mutual interest over the years, and I hope when I head back to Prague in April, maybe there will be another booth to see out and about. Thanks, Alexander! While I’m no longer discovering new booths during my travels at the rate I used to ten or fifteen years ago, a number of work trips have recently brought me to cities where young entrepreneurs operate thriving photobooth businesses—first Florence in July, 2016; then Amsterdam in November; and last month, Paris. I met Virginie and Eddy at their booth on the Rue des Trois Frères in Montmartre, a lovely street‐side machine which operates 24 hours a day, and judging by my inability to get a clear photo without someone in it, is pretty busy most of those hours. We talked photobooths, took some photos, and had a good time connecting over our shared interest. 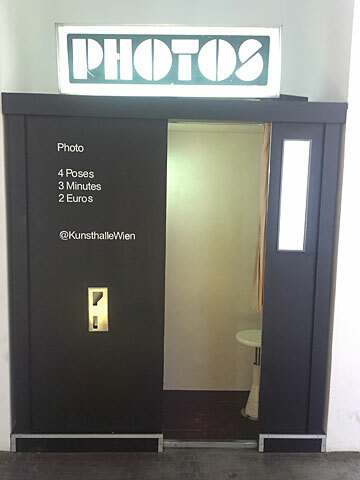 The European photobooth scene is definitely thriving, and I was impressed yet again to see the ingenuity and creativity of the people involved in returning photochemical booths to the continent. With a day to spare in Amsterdam on a work trip, I got in touch with Stefan and Madri at Photoautomat Amsterdam to see if I could meet them and check out their booths around the city. From there, I eventually managed to unlock my bike and followed Madri over to the Student Hotel, a massive residence for exchange students and other travelers, where the booth fits nicely in among the pool and table tennis tables. The machine is a Model 17P, and turned out a nice bright strip of photos. Finally, we headed to the Hoxton Hotel, for one of the most impressive booth locations I’ve ever seen. The photobooth is tucked inside a perfectly‐sized alcove at the top of a long set of stairs, which lead only to the booth, so you feel as though you’re approaching a throne or altar as you prepare to take your photos. It was a fitting end to a great tour, and I look forward to seeing where they place their next booth. Thanks again to Madri for showing me around, and congratulations to Stefan and Madri for running a great photobooth operation that is keeping the photochemical tradition alive in Amsterdam. 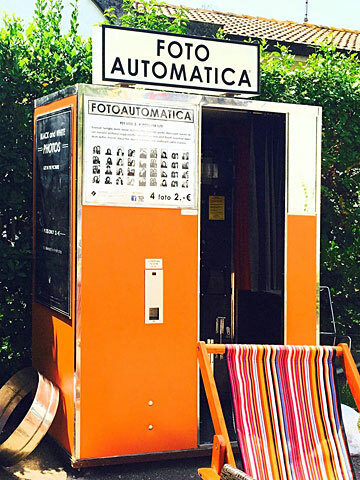 Matteo Sani of Fotoautomatica in Florence has been keeping in touch with Photobooth.net for years, since we first became aware of his lovely outdoor booths in Florence in 2011. I always hoped to visit him and tour his booths one day, and finally, a work trip to Italy this summer provided the opportunity. Matteo and I met at the train station in Florence, and our first stop was just outside, a busy booth on the Piazza della Stazione. Next, we headed to a booth on the via del Proconsolo, a great location in the heart of Florence. The booth was in constant use while we were there. We then left Florence to head to Matteo’s workshop, home to booths in the process of being restored, as well as spare parts, chemicals, and of course, lots of photostrips. We talked booths, had lunch, and headed back to Florence. It was a memorable day, and one of those wonderful photobooth connections that the site and its readers have enabled. Thanks, Matteo! Returning to the UK for the first time in nearly a decade, The International Photobooth Convention 2016 will take place Monday 9 — Friday 13 of May at Fred Aldous in Manchester. Led by photobooth artists Mr Mixup and Kate Tyler along with Ali Gunn from Fred Aldous, the convention will be a celebration of analogue photobooths through workshops, discussion, exhibition, and film. Mr Mixup, Kate Tyler and local artists Caroline Dowsett, Aliyah Hussain, Mariel Osborn, John Powell‐Jones and Layla Sailor will be running workshops and informal drop‐in sessions throughout the convention which will explore the creative potential of the analogue photobooth. Visitors to the convention will have the chance to collaborate with the artists, experiment with different creative techniques and create their own mini masterpieces. To coincide with Manchester After Hours, on the Thursday of the convention Fred Aldous be staying open late for Freds at Night III. From 6–8.30pm, Fred Aldous and The International Photobooth Convention will be hosting an evening of creative collaboration, photobooth mugshots, 3 minute live portraits and the legendary Freds at Night Risograph zine workshop hosted by Mono print collective. On the final day of the week between 12–5pm the International Photobooth Convention play host to a Dog Day Afternoon. Visitors are invited to bring their dog in for a free photobooth portrait and to enter into the Fred Aldous Instagram dog show. Throughout May, Fred Aldous will be exhibiting work by Mr Mixup and Kate Tyler along with artworks created during the course of the convention. 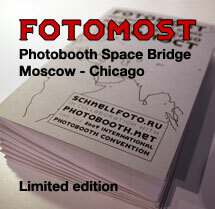 The International Photobooth Convention is free and open to all. Full Convention Programme and workshop booking information announced in late February via fredaldous.co.uk.